HHL was elected among the Top 10 German universities in increasing sustained entrepreneurial culture and spirit. The German Startup Monitor (DSM) 2018 has again evaluated how many founders of startups studied at which university. So the published ranking shows the Top 10 of those business schools which verifiably understand entrepreneurial spirit and support the startup ecosystem of their region. Many uccessful German founders studied at HHL Leipzig Graduate School of Management and that catapults HHL on place 7, just behind the big players like TU Munich, TU Berlin, FU Berlin or Mannheim and Aachen. “This is a confirmation of HHL’s entrepreneurial strategy and very good news shortly after the 120 years anniversary of HHL.”, comments Prof. Dr. Stephan Stubner, Dean of HHL. DSM is edited by the Federal Association of German Startups (BVDS) and KPMG. Founded in September 2012 in Berlin, BVDS explains and represents the interests, positions and concerns of start-up companies in relation to legislation, administration and the public. KPMG is one of the leading auditing and consulting companies with around 200,000 employees around the world. Representing 1,550 startups with 17,647 employees and 3,763 founders, the German Startup Monitor (DSM) is a comprehensive study on the startup ecosystem in Germany. The support of this year’s DSM by relevant players of the German start-up scene has been greater than ever: More than 300 partners have spread the survey in their networks and thus contributed to a differentiated look at startups throughout Germany. Founders and members of the management of startups had the opportunity to participate in the online survey on the DSM. In May, they received a special survey link which was distributed exclusively by the startup association and the selected network partners. The presentation of the DSM was organized this year at Movinga GmbH. After a brief introduction by Alexander Hirschfeld and Marie Westphal (both BVDS), Florian Nöll (Chairman of BVDS), Tim Dümichen (Partner at KPMG – Sponsor of the DSM) and co-author Prof. Dr. med. Tobias Kollmann (University of Duisburg-Essen) presented this year’s survey results. For the first time, the DSM offers a detailed insight into the motivation of founders, new insights into the importance of digital expertise and the role of key technologies such as artificial intelligence. 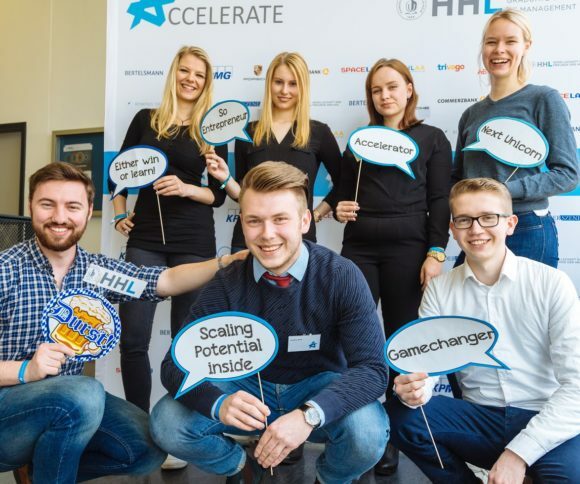 HHL Leipzig Graduate School of Management has developed into a very successful incubator for company creation with more than 280 start-ups established by HHL alumni over the past 20 years. The founders’ entrepreneurial commitment has created more than 10,000 jobs already. HHL’s graduates have established four of the rare unicorns (companies worth more than US$ 1 billion ) – Trivago, Delivery Hero, AboutYout, and Auto1 – as well as companies whose brands are now well-known such as Mister Spex, Coffee Circle , Kale and Me, Lecturio or Flaconi. SpinLab – The HHL Accelerator has been awarded gold status in a national ranking by the Rheinische Fachhochschule in Cologne. The recognition places it among the three best of its kind in Germany. In 2013, 2014 and 2017, HHL already reached one out of the three first places for the best entrepreneurial universities in Germany cited in the Start-Up Radar ranking published by Stifterverband für die Deutsche Wissenschaft (Founders’ Association of German Science) and the German Federal Ministry for Economic Affairs and Energy (BWMi).